The total number of cases from 1984 to 2016 (33 years) totalled 709. The data collection methodology varied for different periods labelled (A)–(E) in the text below and by colour in the figure. The colours identify the periods for which the same data collection methodology was used. The references retain the numbering they have in the text: (A) 1984–1996 data (blue bars) were published in a letter as a bar chart12 and was collected using the clinical and/or microbiological (culture or histology) criteria used in a previous study.7 (B) 1997–1999 data (red bar) were available from a national survey4 for a 24-month period 01 October 1997 to 30 September 1999 for which annual figures are not available: there were 37 cases in this 2-year period. (C) From 2000 to April 2012 (green bars) cases were identified from our current microbiology laboratory electronic database, and an electronic letter search of our electronic patient database, both of which started in 2000. Criteria for inclusion were a positive Acanthamoeba culture, histopathological confirmation of trophozoites and/or cysts, culture-negative cases shown to have Acanthamoeba cysts on confocal microscopy, and those with a typical clinical course and response to treatment.4 (D) From March 2012 to December 2013 (yellow bars) cases were identified prospectively as part of studies being carried out on Acanthamoeba keratitis (AK) using the criteria described for the (C) period. (E) From 01 January 2014 to 31 December 2016 (black bars) cases were identified by retrospective audit, using the same criteria as for (C) but with the addition of Acanthamoeba DNA identification by PCR as an additional inclusion criterion. ‘*’ represents https://www.statista.com/statistics/429790/wearers-of-contact-lenses-united-kingdom-ireland/ (data from the Association of Contact Lens Manufacturers market report 2014: technical summary). Patients using CLs and attending Moorfields Accident and Emergency (A&E) Department completed a self-administered questionnaire based on those used in previous studies,7 14 providing data on demographics, lens type, wear schedule, lens care and frequency of disposal, lens wear experience, frequency of practitioner aftercare, showering and bathing when wearing CLs and smoking. Cases were reusable daily wear CL users diagnosed with AK having an initial attendance in the Moorfields A&E service. These included both self-referrals, secondary (general practitioner and optometric) and tertiary (other ophthalmology centres) referrals. These were identified between 14 April 2011 and 28 August 2014. Cases diagnosed before ethics approval was given on 18 February 2013 were recruited after diagnosis, subsequent to ethics approval cases were recruited at the time of diagnosis. Inclusion criteria for AK cases were the same as those used for the incidence study and are described in figure 1C,E. CL solutions were classified and analysed by the principal active ingredient using information derived from the packaging or manufacturers where possible or retailers when we could not establish the formulation from the first two sources. The classification is in online supplementary table 2. CLs were classified and analysed by their material using a simplification of the American National Standards Institute Terminology for Contact Lenses Reference Z80.20–2016 and checked for each CL brand, or rebranded lens, against the UK Association of Contact Lens Manufacturers Annual Handbook for the years of the study. These data are summarised in online supplementary table 3. The main analysis sample included all eligible controls collected during 2016–2017. A sample size of 60 cases and 180 controls was expected to provide 85% power (alpha 0.05) to detect a minimum odds ratio (OR) of 2.7% assuming 20% of the controls were exposed. Initial assessment of potential risk factors was carried out one at a time using logistic regression without adjustment for confounding and is described in online supplementary table 4. CL hygiene compliance is an important potential risk factor and the methodology for calculating the score used for this analysis is described in online supplementary table 5. Following this initial assessment, multiple logistic regression models were constructed to obtain estimates of ORs adjusted for confounding effects. ORs are reported in this study as estimates of relative risk. Variables selected initially for inclusion in the model building process were those having p values of <0.2 from the unadjusted analysis together with variables thought a priori to be risk factors for AK: hygiene score, hand washing before lens handling and the principal active ingredient of the disinfection solution. The distribution of cases and controls for these variables are shown in table 1. In constructing each final multivariate (MV) model, one exposure variable was considered as the ‘exposure of main interest’ and all others as ‘auxiliary factors’ (potential confounders). The final MV model was thus optimised to estimate the adjusted OR for the ‘exposure of main interest’; covariate adjustment is described in online supplementary table 6. The performance of logistic models—goodness-of-fit and discriminatory ability—were assessed by calculating the Hosmer-Lemeshow p value and area under the receiver operating characterisitic (ROC) curve, respectively. The statistical package used was Stata V.14.2 (StataCorp). Figure 1 shows the numbers of cases from 1985 to 31 December 2016. Annual numbers were 8 to 10 p.a. from 2000 to 2003, after which there was an annual increase from between 15 and 23 p.a. from 2004 to 2009, rising from 2010 to the current level of between 36 and 65 cases p.a. Estimates of CL wear prevalence are given for datapoints throughout this period. There were 63 confirmed AK cases in reusable CLs wearers, with no exclusions: 18 cases, diagnosed up to 22 months before 18 February 2013 (when ethical approval was obtained), completed the study questionnaire retrospectively. The remaining 45 AK cases and all the controls completed the questionnaires at the time of diagnosis. Cases were compared independently with the two different control datasets; one additional case was excluded when the initial clinical diagnosis of AK was not confirmed on follow-up. There were 56 eligible controls from the first control dataset from which CL using controls were excluded if they had CL-related disease. Following the analysis of this dataset, concern was expressed by an external advisor about a potential bias in the selection of these controls. As a result, we reopened the study to obtain the second and fourfold larger control dataset of 213; exclusions were true daily disposable and overnight wear lens users, CL users with AK, 15 with missing CL solution or CL brand information (despite three contact attempts), one who left the hospital before being seen for diagnosis and two whose records could not be retrieved to confirm the outcome. The findings from the analysis of the first dataset were similar to those of the second. The second dataset was chosen for the analysis reported here as giving a more conservative estimate of some ORs. Differences between the two datasets made their combination inappropriate. The results of the assessment of putative risk factors for AK, carried out independently for each exposure without adjustment for confounding, are shown in online supplementary table 4 for the 63 AK cases compared with the entire second control dataset of 213. This control dataset includes both subsets with (n=109) and without (n=104) CL-related diseases. Both of these subsets of controls were included in the analysis as being likely to give a conservative estimate of the relative risk of exposures for AK, given that these may be shared with the risks for some of the non-Acanthamoeba CL-related keratitis conditions listed in online supplementary table 1 which made up 64/109 (59%) of the diagnoses in this subset. The mean age in the whole sample was 33.9 (SD 12.26). The median age was 30 (range 13–76), with 25th and 75th percentiles of 25–40 (IQR). The distribution was similar in cases and controls: median of 30 in both and IQR 25–49 and 25–38, respectively. Thirty-three of 63 (52%) of the cases and 152/213 (71%) of the controls were women. The use of Oxipol disinfection of 4.74 (CI 1.83 to 12.30, p 0.001). Wearing group IV (high water content, ionic hydrogel lenses) of 6.71 (CI 1.31 to 34.29 p 0.022). Poor CL hygiene practice of 3.34 (CI 1.52 to 7.38 p 0.003). No, or uncertain, hand washing before lens handling of 3.65 (CI 1.52 to 8.77 p 0.004). Wearing CLs in swimming pools or hot tubs of 3.49 (CI 1.51 to 8.04 p 0.003). British (white) ethnicity of 4.82 (CI 1.61 to 14.46 p 0.005). Occupation other than professional/director/senior official of 3.51 (CI 1.52 to 8.11 p 0.003). Rigid gas permeable CL solutions were included in the lens disinfectant analysis, and these solutions were associated with a higher risk of keratitis compared with the referent: this does not imply a higher risk for AK associated with rigid lens use per se. The incidence study has confirmed a current UK outbreak in south east England starting in 2010/2011, resulting in a mean of 50.3 p.a. (range 36–65) treated at Moorfields for the years 2011–2016 compared with the most accurate estimate of the numbers between outbreaks, of 18.5 p.a. at Moorfields from the prospective national audit carried out over 2 years in 1997–1999.4 Given the limitations of the data collection methodology, particularly for the earlier years of the period 2000 to 2012, it is possible that the numbers of cases between 2000 and 2003 are underestimates. On the other hand, the apparent rise in cases in 2004, that was subsequently maintained until a further rise in 2010–2011, may relate to the outbreak in the USA due to the failure of the CL disinfectant AMO Complete Moisture Plus. The latter resulted in a 17-fold rise in cases in the USA but, following withdrawal of the solution, numbers have remained at similar levels for reasons that are unclear.11 The industry data on CL user numbers in figure 1 suggest that this current UK outbreak is independent of changes in the prevalence of CL wear. Between 80% and 90% of AK cases are potentially avoidable if effective disinfection systems are used, good CL hygiene practice followed and exposure to water while using lenses is avoided.4 7 This current study confirms these previous risk factors and identifies new independent risk factors including deficient hand washing, race and occupation-associated risks (which are probably surrogates for safe CL lens use either from not receiving or following appropriate instruction). It has also confirmed our initial hypothesis that a CL solution may have been associated with the outbreak given that Oxipol-based disinfection was also an independent risk factor (OR 4.74, CI 1.83 to 12·30, p 0.001). This risk is relatively low compared with that of the previous outbreaks of AK associated with CL solution failures: a 40-fold higher risk of AK for users of chlorine-based disinfection systems in the UK7 and 17-fold higher for users of AMO Complete Moisture Plus in the USA.8 11 The occurrence of AK in an individual patient who has used Oxipol cannot be attributed only to the Oxipol disinfection because: AK develops in some patients who do not use Oxipol (not a necessary﻿ cause), and also many patients who use Oxipol do not develop AK (not a sufficient cause). The same applies to the other risk factors. Since the time of the investigation Oxipol solution has been phased out by the manufacturer. Research findings that support the risks of exposure to contaminated water are numerous. Deficient hand washing (including drying after washing) and water activities while using CLs have been associated with AK in this and other studies. Showering in CLs was not a statistically significant independent risk factor in this study but, given known risks of exposure to contaminated water while wearing lenses in other contexts, this should be avoided. Contact lens case contamination by Acanthamoeba spp has been found in 1%–7% of asymptomatic CL users.22 Most water that CL users are exposed to may be contaminated by Acanthamoeba; domestic tap water in Turkey,23 South Korea,24 Hong Kong22 and the UK3 as well as swimming pool, hot tub and lake water.25 Furthermore, in a UK study, genetically identical organisms were isolated in the domestic water supply of six patients having AK. In the UK the disease is more common in hard water areas,3 probably because limescale in taps provides an optimal environment for the organism.4 A seasonal association with AK has been related to increased participation in swimming in the summer months.11 To establish whether there might have been a ‘London Olympic effect’ since 2012, resulting from increased participation in swimming by CL users, we compared control data from a 2004/2005 study14 with this current data, but have shown no difference in swimming activity amongst CL users for these two periods (online supplementary table 7). Given the importance of contaminated domestic water supplies in these studies, it follows that small changes in the disinfection of domestic water supplies, that might lead to an increase in the exposure of the population to water contaminated by Acanthamoeba, could have a substantial effect on incidence of AK. The incidence of AK among CL users has historically been 5 to 15-fold higher in the UK than in other countries, probably as a result of contaminated domestic tank stored tap water.3 4 In the USA implementation of US Environmental Protection Agency legislation in 2002, designed to reduce chlorine generated, potentially carcinogenic, disinfection by-products, was temporally related to an outbreak of AK in the Chicago suburbs. This legislation had resulted in treatment plants introducing a number of measures to minimise disinfection by-products including a reduction in the amount of chlorine used and a switch to the use of chloramine, a less potent disinfectant than chlorine. These measures may have resulted in increased microbial contamination of the water delivery pipes, providing a larger food source for Acanthamoeba and resulting in increased Acanthamoeba contamination at end-user sites.26 However, the use of chloraminated water supplies (not implemented and therefore not relevant to the Chicago outbreak) was excluded as a potential cause of the 2004 national outbreak of AK in the USA.8 In the UK, the 1998 European Council Directive 98/83/EC shared similar aims. Although the directive was not introduced formally into UK national law until January 2010,27 coinciding with the start of the current outbreak of AK, informal discussion with three of four﻿ major suppliers of water to the south east, and scrutiny of the Drinking Water Inspectorate website,27 has not identified any changes in disinfection procedures in 2010–2011 which might have led to increased end-user exposure to contamination by Acanthamoeba, above what are probably historically high levels due to both the widespread use of domestic tank stored water in the UK and the hard water supplies which dominate in south east England. A potential weakness of this study is the difference in recruitment periods for cases and controls. We do not think that this is likely to have resulted in significant bias, due to changes in exposure to CL solutions, as there was overlap between the recruitment periods for the cases and that for the first control group for which findings were confirmed. Unfortunately, changes in market share of CL disinfection solutions are proprietary to the manufacturers who have not felt able to make these available to us. On the other hand, one of the strengths of this study is our proven rationale for the choice of both cases and controls from patients attending Moorfields A&E service. This minimises potential recruitment bias by recruiting both from a similar catchment area. We have followed this practice in previous studies.7 14 28 In the 2008 study, we used community-derived CL controls chosen from the postal code areas in which the cases were living for comparison with the A&E control population. However, the results of the analyses were no different for the community controls (both time consuming and costly to recruit) compared to those from the controls derived from the A&E Department.14 As a result we chose to use only A&E Department controls in the current study. This study has confirmed a persisting outbreak of AK in the south east of England, starting in 2010–2011. This probably reflects the situation elsewhere in the UK, at least for hard water areas. AK should be a largely preventable disease with over 90% of CL users developing AK having identifiable, avoidable risk factors.4 We think it unlikely that the current outbreak results from any of these current risk factors in isolation. However, if the following measures are taken the risk of developing AK is likely to be very low: improving CL and hand hygiene when inserting lenses, avoiding the contamination of CLs with water including when engaging in water activities while using CLs, avoiding the use of CL solutions by switching to daily disposable CL use or, for those continuing to wear reusable lenses, maintenance of optimal lens care with effective solutions. Publicity for these measures, as in the 1991–1995 UK outbreak,12 can be expected to rapidly reduce the incidence of AK. Water avoidance publicity for CL users (by water companies, water sports facilities, the CL industry and eye care professionals) can be expected to reduce the incidence in the longer term. The addition of ‘no water’ labelling on all CL packaging29 should become mandatory. Ongoing surveillance of AK incidence by major UK ophthalmic units will identify future changes in incidence more rapidly than for this current outbreak and trigger the establishment of a case control study to identify avoidable causes. Surveillance of end-user domestic water contamination by the water companies is currently limited to measuring faecal bacterial contamination: the addition of Acanthamoeba to this panel can be expected to contribute to our understanding of local variations in the risk of exposure and make CL users aware of the importance of maintaining preventive measures. Moorfields Eye Hospital staff: the Accident & Emergency Department Nurses for their help in identifying control contact lens users. Melanie Mason and the Corneal Clinic staff for assistance with recruiting cases. Varshini Parayoganathan and Sophie Connor in Research and Development for database management.
. Acanthamoeba keratitis in 194 patients: risk factors for poor outcomes and severe inflammatory complications. 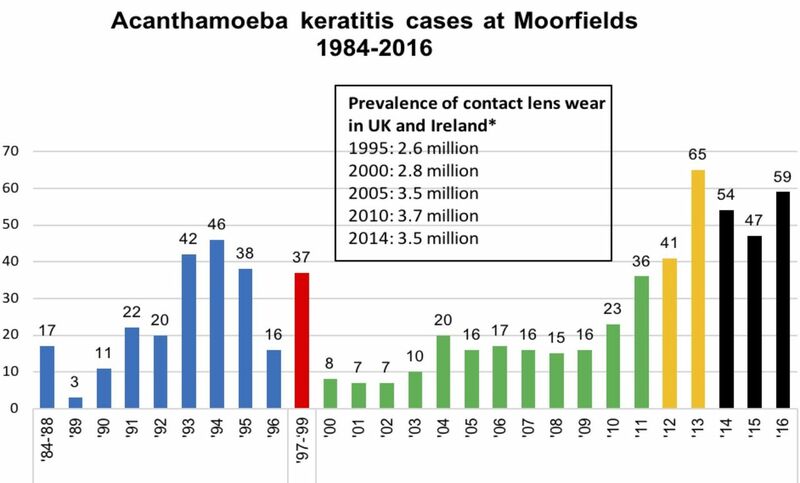 Br J Ophthalmol 2017:pii: bjophthalmol-2017-310806.
. Acanthamoeba keratitis in soft contact lens wearers. A case-control study. JAMA . 1987;258:57–60.
. Nonulcerative complications of contact lens wear. Relative risks for different lens types. Arch Ophthalmol . 1992;110:1601–6.
. Detection of acanthamoeba in tap water and contact lens cases using polymerase chain reaction 11. OptomVisSci 2008;85:526–30. Water CIoD, 2011. Drinking water 2011 London and South East region of England. PublicWater Supplies Regional Reports. Available from: http://www.dwi.gov.uk/about/annual-report/2011/london&se.pdf [Accessed 24 Dec 2017]. , 2017. Campaigning recognition for "no water" campaign 2016. Available from: https://www.aop.org.uk/ot/industry/charity/2016/06/13/campaigning-recognition [Accessed 23 Dec 2017]. Contributorship NC: submitted the research and ethics applications, recruited the cases, co-ordinated recruitment of the first set of controls, prepared the incidence dataset from 2000 to 2014 and contributed to the planning and execution of all aspects of the study. JJH: collected the incidence data for 2015/2016. SV: facilitated the identification of controls and cases in the Moorfields A&E Deptartment. CFR: assisted questionnaire design, the dataset collection and recruited the second set of controls. DCM: contributed to study planning and carried out the statistical analysis. JKGD: planned the study, assisted with the data collection and co-ordinated the preparation of the manuscript. All authors contributed to the manuscript. Funding Grants from Fight for Sight (1542/43 and 1465/6), Moorfields Eye Hospital Special Trustees (ST 12 09A), anonymous donors to Moorfields Eye Charities, and from CooperVision UK. Part of John Dart’s salary was paid by the National Institute of Research (NIHR) Biomedical Research Centre (BRC) at Moorfields Eye Hospital NIHR BRC. Dr Carnt was supported by an NHMRC Early Career CJ Martin Fellowship (APP1036728). Disclaimer None of the funders had a role in the design or conduct of this research although one reviewed the manuscript; modifications were limited to clarification and grammatical changes. The views expressed are those of the author(s) and not necessarily those of the NHS, the NIHR or the Department of Health. Competing interest statement CooperVision UK, one of whose products has been identified by this study as a risk factor contributing to the development of Acanthamoeba keratitis, funded the recruitment of the second set of controls. This was to verify the findings of the first set as there was a perception that the selection of these may have been biased. This did not prove to be the case and the company has since phased out the product. CooperVision did not influence the study design. Representatives of CooperVision reviewed the manuscript but made no changes other than clarifications and grammatical changes. Ethics approval National Research Ethics Service Committee London-Hampstead, REC Reference 13/LO/0032 and the Moorfields Eye Hospital Research Governance Committee. Data sharing statement None are available. The study database, from which the reported analysis has been done, can be provided if this is requested by a commercial organisation who wishes to contest the findings. We believe we have precluded any real likelihood of such a request being made by having had extensive pre-submission discussions with CooperVision, whose product is identified as being associated with an increased risk of AK. They have agreed the contents of the manuscript.